Key difference: The word, ‘assure’ is used as a promise. It is used to make somebody confident about something or to convince them of something. ‘Ensure’, on the other hand, is used to confirm or guarantee something. It makes sure that something will happen. 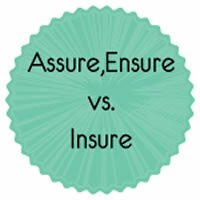 The words ‘assure’ and ‘ensure’ are commonly used interchangeably. This is mainly due to the fact that not only do the words look alike, sound alike and are even spelled alike, they actually originated from the same source. Both words ‘assure’ and ‘ensure’, in addition to ‘insure’ originated from the Latin securus, meaning ‘secure’. However, the words do actually have a difference meaning in context and are used at different instances. The word, ‘assure’ is used as a promise. It is used to make somebody confident about something or to convince them of something. ‘Ensure’, on the other hand, is used to confirm or guarantee something. It makes sure that something will happen. To secure or guarantee: This letter will ensure you a hearing. To make sure or certain: measures to ensure the success of an undertaking. To make secure or safe, as from harm. I assure you the car is safe to drive. She assured us that she had done what she promised. I can assure you that the money will be paid. In all of these markets, reform must assure transparency, prevent abuse, and protect the public interest. Conversely, oil companies might sell futures contracts to assure a profit against future price drops. John assured Mary that he'd come to the party early. I assure you that I have been honest about the money I spent. The law ensures that you will have a fair hearing. Ensure that you have plenty of gas in the tank before going on a long trip. We need to ensure that she keeps her promise. Hard work will ensure your success. Senator Bordallo has been fighting to ensure that the people of Guam have a voice in Washington. To ensure that as many Democrats as possible can cast their votes. While we do not know all the details of this arrangement, the Fed must ensure that the plan protects the families that count on insurance. To ensure there'd be enough food, Mary ordered twice as much food as last year. Mauricio saved money from every paycheck to ensure he could buy gifts for his family at the end of the year.